Below you'll find recommendations regarding what items to draw and in what order (the “cartographer's check list”). Select an item to map. Objects on the map include any areas, buildings, roads, rivers, and so on. There are objects that must not draw on the map (for more information, see 3.1.4. Forbidden items . Adding map item attributes: assigning values to attributes (i.e. characteristics) of map items. For example, the type of roadway, name of a locality, or height of a building. For more information, see Section 3.2. Administrative divisions. The best approach is to draw roadways in order of their significance, from expressways down to alleys or driveways between buildings. For more information, see the section 3.12. Transport: railways. Hydrography: linear and polygonal items. For more information, see Section 3.9. Vegetation. For more information, see Section 3.14. Transport: ground. 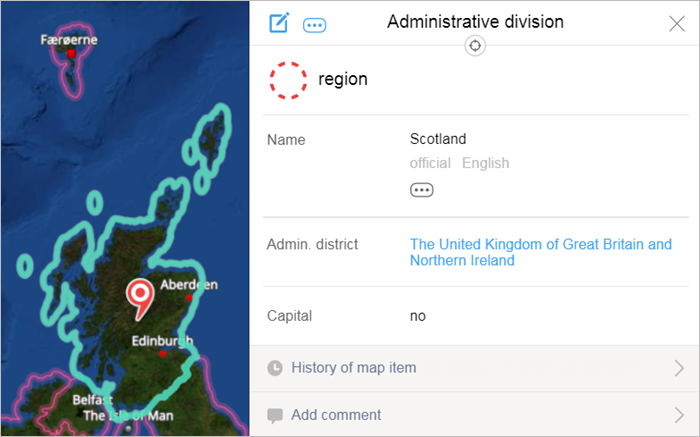 Draw organizations within buildings as places classified under the “Locations” category. Different icons are used to represent various organizations. The organization's placemark will appear in the center of the icon. 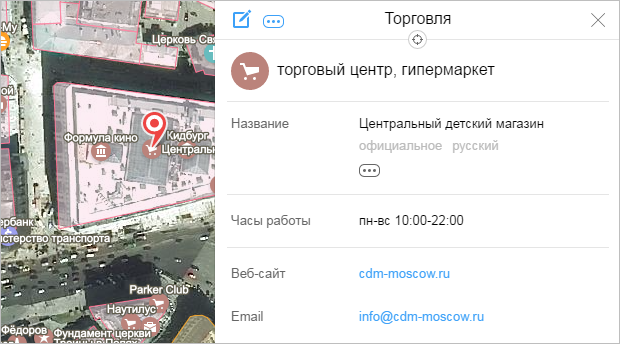 Put the placemark at the entrance to the organization (if it has a separate entrance), or at its approximate location (for example, if you are mapping a store inside a shopping complex). Small commercial and industrial facilities and structures (sheds, transformer substations, boiler houses, etc.). When drawing and attributing such items, observe the restrictions on specifying the technical characteristics of the items (see Section 3.1.4. Forbidden items . 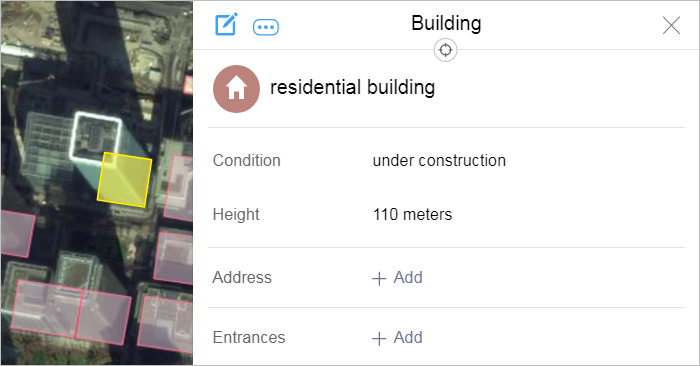 Draw as “Structure, building site” map items classified under the “Buildings” category. For more information, see section3.4.2. Rules for attributing buildings. Garage complex territories (see 3.7. 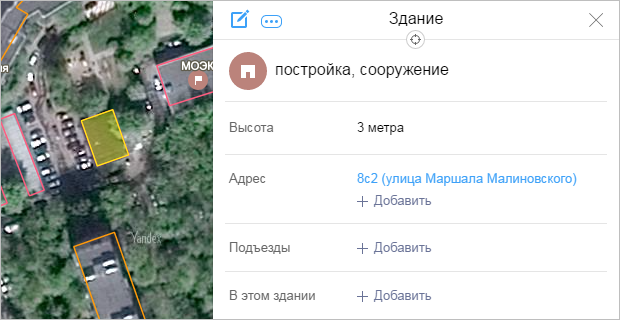 These areas) are outlined using an “Industrial park”-shaped polygon only if this is a named garage cooperative or large garage area regardless of whether it has been assigned an official name. In other cases, garage territories are not marked. Don't draw free-standing garages (such as individual “shells”). Draw as “Parking” map items classified under the “Road infrastructure” category. Pedestrian paths and crosswalks, bike paths. Draw bike paths, pedestrian paths, bridges, stairs, and crossings. For more information, see section3.3.1.6. Rules for drawing sidewalks as well as pedestrian and bicycle paths. Lawns and small areas of vegetation. Use “Hydrography” placemarks (under the “Hydrography point” category) to draw springs, wells, water pumps, and fountains. For more information, see section 3.10. Hydrography. Borders of city areas: borders of administrative areas, subdistricts, blocks. Road infrastructure: road structures including squares, bridges (including pedestrian ones), underground and aboveground pedestrian crosswalks and tunnels. Road infrastructure also includes parking, video cameras and traffic lights. 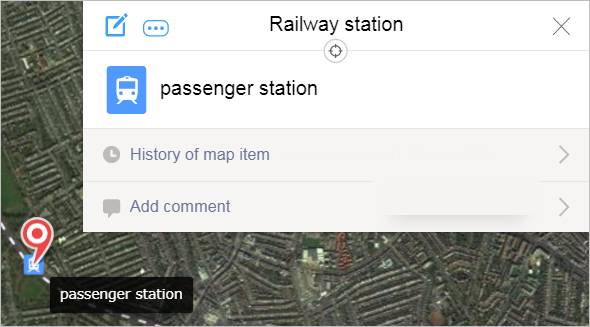 Draw as map items classified under the “Road infrastructure” category. For more information, see section 3.8. Road infrastructure. Territories including buildings and structures (and the complexes they are part of), which are designated according to their use. For example, the territories of educational institutions (academic buildings, dormitories), beaches, etc. Industrial zones can cover large territories that are completely occupied by industrial buildings, or cover the territories of individual enterprises. For more information, see section3.7. Territories. Draw Attractions (monuments, viewpoints) and courtyard infrastructure (playgrounds, dog parks, dumpsters, etc.) as places classified under the “Locations” category. For more information, see 3.6. Locations. Draw the territories of hospitals, schools, and sports complexes using individual polygons and label them as independent map items. 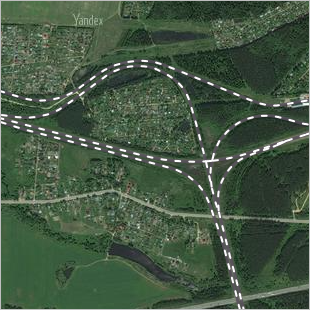 Map items related to road networks or infrastructure that are under construction or were recently built: roads, interchanges, bridges, tunnels, underground and aboveground crosswalks. See Sections3.3. Roads, 3.8. Road infrastructure. New buildings: buildings that are already commissioned or under construction. Demolished or destroyed buildings and structures. 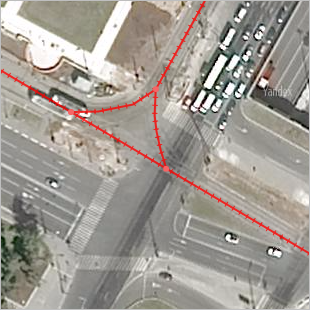 If there is a building on the satellite image, but it no longer exists in reality, set the value of the “Condition” attribute as “Demolished”. Organizations that have changed: new buildings opened, existing ones changed, the business moved to a new location (for stores, malls, cinemas, pharmacies, etc.). 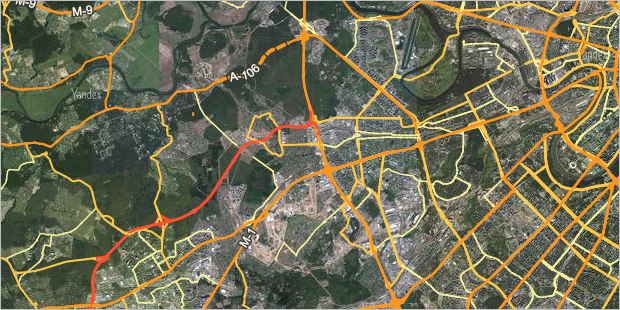 Transport networks that have changed: new routes or transport stops were added or stops were removed from a route. Streets that were re-named (note that the addresses of those residential buildings and organizations will also change in this case). Administrative division borders change. For example, if new territories are added to a city, part of a city's territory splits off, district borders change, etc. See Section 3.2. Administrative divisions.